August 12th, 1921. We have finally reached the port of San Francisco, the last leg of our trip around the world. Among the relics we have gathered is a surprising collection of flowers and beautifully decorated skulls. During our travels, their fascinating presence has opened my mind to the rules of a captivating traditional game: �The Game of Skulls.� I�ve immediately represented these skulls and flowers on a series of cardboard cards and transcribed the rules in order that others may enjoy this game as much as I and my crew. Bid, bluff, and make the desperate gambits you need to claim victory! Skull is a classic game of deception and gambling for three to six players. Previously known as Skull & Roses, this game challenges you to outwit your friends and lure them into traps when they least suspect it. Is your friend going to try for victory this round, or is that exactly what he wants you to think? You can never be sure what your friends are thinking in a game of Skull. Skull is played very simply. At the beginning of the game, each player has four discs. Three discs feature flowers, and the fourth disc shows the grinning visage of a skull. To begin a round, all of the players simultaneously choose one of their discs and place it facedown in front of them. On your turn, you have a choice to make: you can either add a new disc to your stack or bet how many flowers you can reveal without revealing a skull. If you decide to add a disc, you choose one of your remaining discs and place it on top of the first. Then, the turn passes to the next player. Alternatively, if you choose to bet, the next player can either raise your bet or pass and step out of the round. As soon as one player bets, no more discs can be added to the stacks�each player must either raise the bet or pass. If everybody else has passed, you must attempt to fulfill your bet by turning over a number of discs equal to your bet. The catch, however, is that you must reveal all of your own discs before you reveal anyone else�s. If you reveal a single skull�your own or another player�s�you fail your bet, and you lose one of your four discs. If you lose all of your discs, you�re out of the game! If, however, you successfully complete your bet by turning over enough flowers, you gain a point. You only need two points to win a game of Skull, so you can be certain that everybody will be even more eager to trap you once you�ve scored a single point. Are your opponents making a gamble to win? Or are they just trying to make you think they�ve played flowers? Every disc may hide a grinning skull beneath its innocent surface. Enter a world of deception and second-guessing by picking up your copy of Skull at your local retailer today! �Tricky bluffing game with deep tactics and strategy. �Reinvented art to bring new life to this deceptively simple game. �Created by renowned designer Herv� Marly. 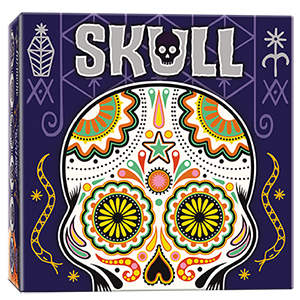 Skull is the quintessence of bluffing, a game in which everything is played in the players' heads. Skull is not a game of luck; it's a game of poker face and meeting eyes.